Congratulations! We have come to the end of our study on Philippians, the book of JOY. Today is a cappuccino kind of day, so treat yourself. We are going to learn the last key to JOY in the book of Philippians. Let’s get started so I can give a short review at the end. Get your journal ready so you can answer the following questions? What gift did the church of Philippi give Paul (verses 15-16)? 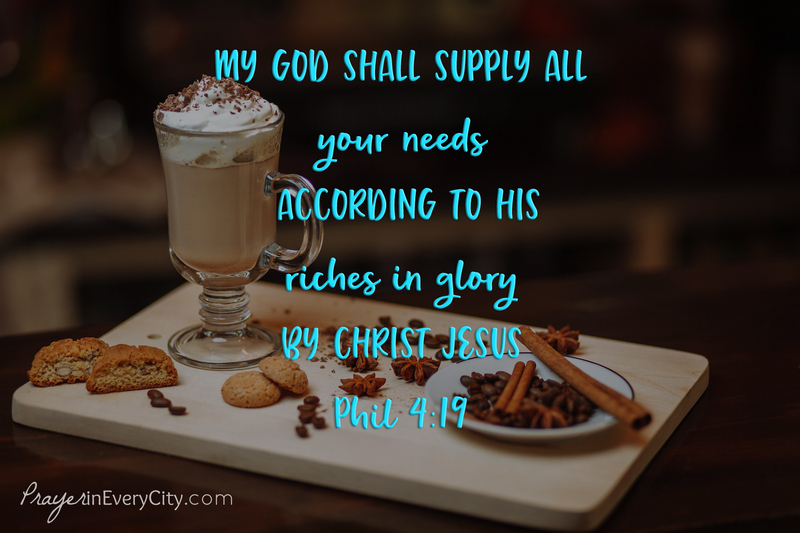 How much did Paul have of what he needed (verse 18)? Who does Paul give credit for taking care of him (verse 19)? Paul can be content because he knows where his strength comes from as well as his needs. We have finished our study of the book of Philippians, but because it took 2 weeks to get through we need to review. JOY is a gift from the Lord which is dependent upon our attitude towards God, others and ourselves. We must have Christlike behavior if we want to have the mind of Christ. If you still don’t have JOY, then read through the book of Philippians again. You want to hide these truths in your heart so they can become a part of you. I am taking a short break from the COFFEE DEVOTIONS. They are very time consuming. Keep your eyes open for the next one in a few weeks.